Hi! If you have appeared here, means you are not indifferent to the Thai cats! These pages are devoted to the Thai cat. That is Siamese cat of an old type. 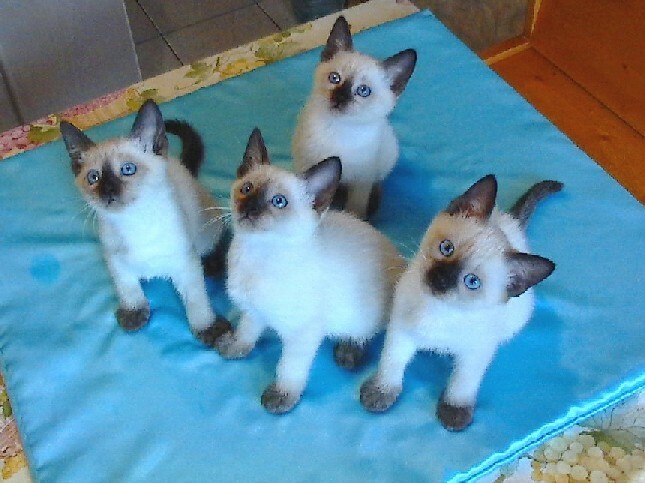 The Thai kittens were born on December 24, 2005!!! Look section "The Thai kittens for you "
The NEW PHOTOS of a WALTZ Gamlet have appeared in section " the SPECIAL OFFER "
Our cattery�s young cat the Champion WCF the Waltz Gamlet has visited on the World exhibition in 1000-year''s Kazan of August 20-21, 2005. Wice the President WCF the international judge on all breeds of the cats Anna Rudakova (Russia) has noted his harmonious addition and excellent type, she has smiled and has noticed that a Waltz is " very tender cat! " - they have liked each other and the Waltz has decided to not leave judge�s table! The international judge from Italy Francesco Picinali was very strict to our cat � He even never has smiled! However, he has written down "Exellent" under all clauses of the ex-terrier and has given him the next title! Yes!